Restarting... what force is exerted between two protons one meter apart? UTF-8 U+6211 U+662F wrote: Restarting... what force is exerted between two protons one meter apart? Using Coulomb's law and knowing protons are elementary charges.... F = (9x10^9)(1.6x10^-19)(1.6x10^-19) / (1)^2... Would the answer be 2.30x10-28 N? Oops, I forgot to specify you could use NOT too. Looks right, your turn! 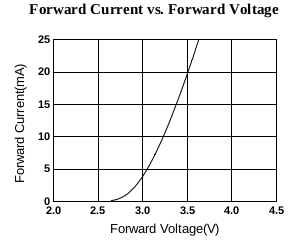 Suppose you find an LED whose datasheet contains the above graph. What value resistor should you put in series with this LED and a 5V power source in order to have a current of 20 mA going through the circuit. The voltage values on the graph give the voltage drop across the LED; you need to calculate the voltage drop across the resistor before you can use Ohm's law to find it's value. Oh, so is it 75 ohms?